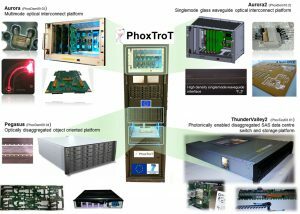 The research project PhoxTroT, ” Photonics for High-Performance, Low-Cost & Low-Energy Data Centers, High Performance Computing Systems: Terabit/s Optical Interconnect Technologies for On-Board, Board-to-Board, Rack-to-Rack data links”, funded by the European Commission under 7th Framework Programme (FP7) – ‘ICT-2011.3.5 – Core and disruptive photonic technologies’, completed successfully its activities delivering the revolutionary optical interconnect solutions towards High-Performance, Low-Cost & Low-Energy Data Centers, High Performance Computing Systems exploiting existing photonic technologies in a holistic way, synergizing the different fabrication platforms in order to deploy the optimal “mix&match” technology and tailor this to each interconnect layer. 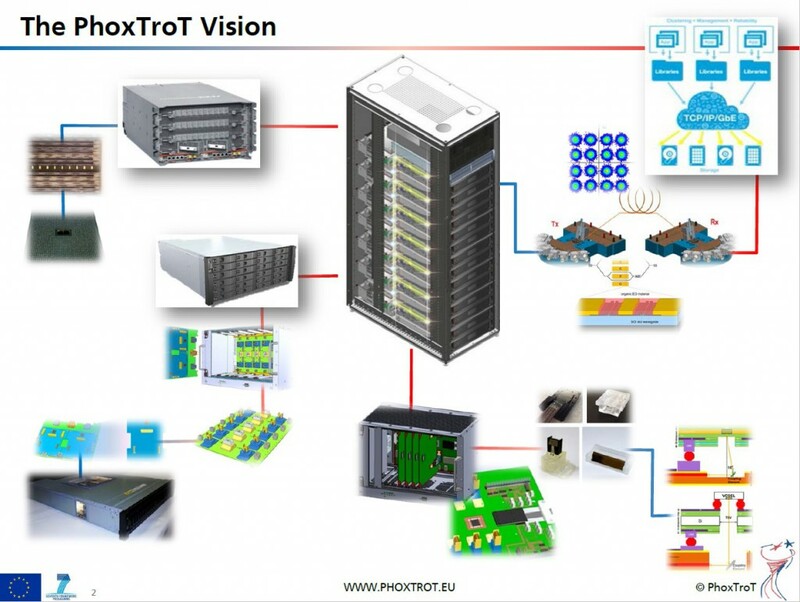 PhoxTroT is a large-scale research effort focusing on high-performance, low-energy and cost and small-size optical interconnects across the different hierarchy levels in data center and high-performance computing systems: on-board, board-to-board and rack-to-rack. PhoxTroT will tackle optical interconnects in a holistic way, synergizing the different fabrication platforms in order to deploy the optimal “mix&match” technology and tailor this to each interconnect layer. PhoxTroT will follow a layered approach from near-term exploitable to more forward looking but of high expected gain activities. Generic building block that can be used for a broad range of applications, extending performance beyond Tb/s and reducing energy by more than 50%. A unified integration/packaging methodology as a cost/energy-reduction factor for board-adaptable 3D SiP transceiver and router optochip fabrication. The whole “food-chain” of low-cost and low-energy interconnect technologies concluding to 3 fully functional prototype systems: an >1Tb/s throughput optical PCB and >50% reduced energy requirements, a high-end >2Tb/s throughput optical backplane for board-to-board interconnection, and a 1.28Tb/s 16QAM Active Optical Cable that reduces power requirements by >70%. This project has received funding from the European Union’s Seventh Framework Programme for research, technological development and demonstration under grant agreement no 318240.